Welcome to Sky Climber®, where Safety ... Service ... and Solutions are our top priority. Sky Climber® has been designing, engineering and manufacturing quality hoists, rigging solutions, and modular work platforms since 1955. 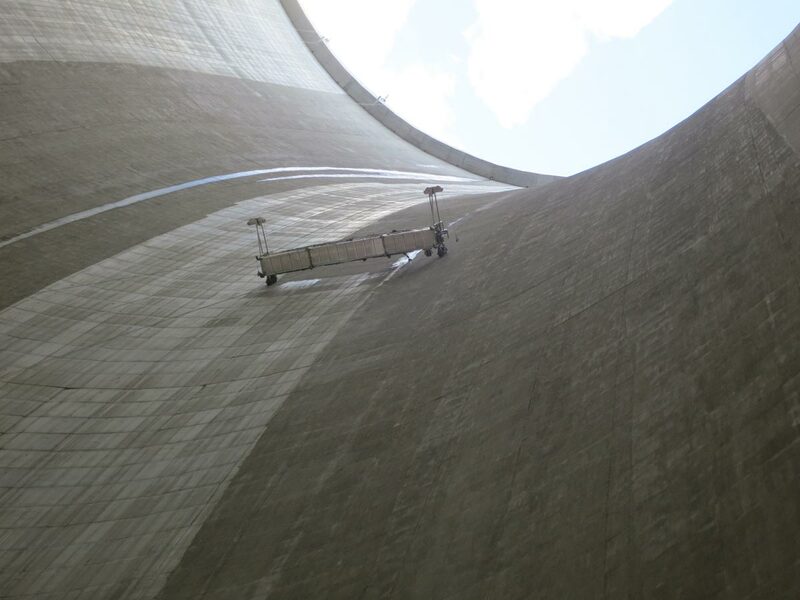 Since then Sky Climber® has designed and manufactured powered suspended access systems for buildings, power station boilers, chimneys, bridges, storage tanks, ships, windmills and virtually anywhere else where access is required. Sky Climber® was the first in the industry to promote Safety, Service and Solutions and continues in a leadership role using this focus as the cornerstones for growth and development into the future. Safety, service and solutions define Sky Climber’s® attitude toward our customers, dealers and employees. First Suspended Access Equipment Company in the world - Since 1955! The industry leader in designing, manufacturing and distributing standard & custom made suspended access systems used in industrial, commercial construction and maintenance applications. Extensive range of top quality powered access systems with no height limit. Electric or Pneumatic powered access solutions. Export to more than 55 countries all over the world. From our European headquarters in Belgium, Sky Climber® Europe has for several decades been most successful supporting its end users and distributor network throughout West- & East Europe, the Middle East, India, the Far East, China, Australia and Africa. The fully integrated LNX hoist from Sky Climber is designed with the user in mind and is compatible with most other platforms in the industry. 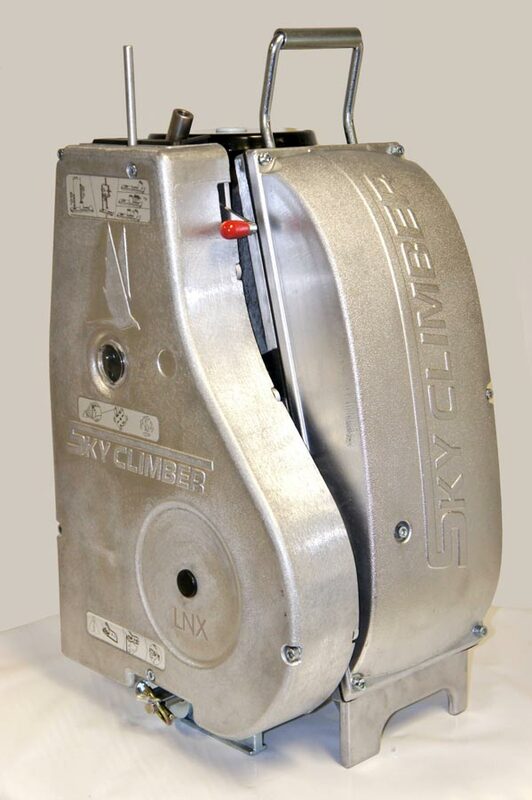 The Sky Climber monorail SC-134 is designed for easy mounting on every type of building or structure. Find out more about our new telescopic mobile roof beam and all the other possible suspension solutions. 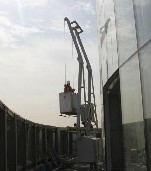 Sky Climber is capable of designing and producing all types of special access solutions. Contact us for more information about our tailored solutions. 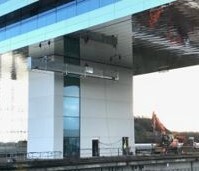 Sky Climber provided the window cleaning system for this 80 m high tower with a BMU roof car and monorails. 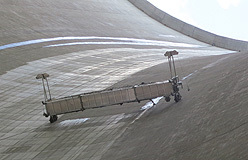 Sky Climber designed and manufactured a solution with monorails to give full access to the underside of the building to perform all necessary maintenance and repair work. Sky Climber provided the access solution for the vertical walls in the central cylindrical structure that will house the vacuum vessel of the plasma container. Kangaroo Creek Dam, Australia : Special Designed Crawler Platform based on standard Sky Stage Ultra Components. Sky Climber Europe provided a cost saving access solution by supplying four custom designed rolling platforms made from standard Sky Stage Ultra components, to access Kangaroo Creek Dam in Australia. Sky Climber Gantries, Sky Stage for the ‘Îlot Ouest’ block, called the "Patio" building in Paris. 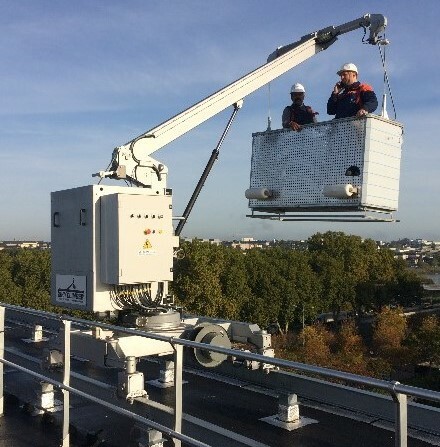 Sky Climber provided an access system to clean the ceiling of the glass roof of the ‘Îlot Ouest’ block, called the "Patio" building in Paris, France. Monorail and Davits for Façade Maintenance / Window Cleaning. Sky Climber was selected to design a cleaning system with monorails and davits for The new Library for the University of Aix-Marseille in France. Sky Climber's custom BMUs were designed to enable façade maintenance for the impressive tower Landmark 81, in Vietnam. REGINA, CANADA : Dance Floor Platform. Sky Climber developed a suspended system to perform glazing and metal cladding work on the underside of a pedestrian bridge linking two office buildings in downtown Regina in Canada. Sky Climber was selected to provide an access system to clean the ceiling of the Skylight as well as the four vertical façades of the atrium from the Novion Building - Moscow Russia. Sky Climber designed a solution with rotatable davit arms that can suspend a 5m Sky PI Platform – or a 1.5m Sky PI Cage in narrow sections and the inside atrium. Davit Arms allow to park the platforms on the roof. The operators of a massive antenna system required a special access solution for a painting project and Sky Climber was happy to help. One of the main architectural features of the building is a 37m long glass Sky Light covering an 85m high atrium. The Sky Light requires cleaning from the inside as well as from the outside. 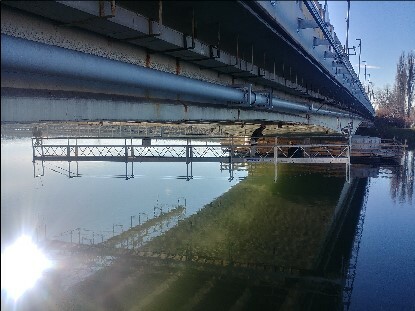 Sky Climber LLC provide a solution with two floating platforms based on the Sky Stage Ultra (SSU) Decks , which spanned the total width of the bridge. The Sky Climber suspended platform was used during the renovation of the refractory surfaces on the sides and ceiling of a Cyclone boiler. 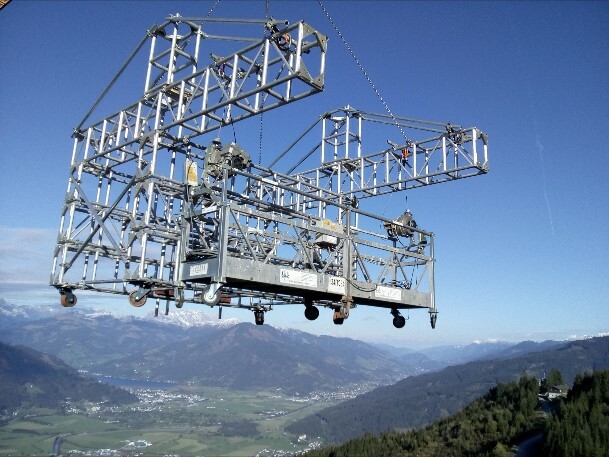 Sky Climber developed special interconnectable 8m and 10m long Sky Stage 500e platforms with shiftable crawl-through stirrups. Sky Climber provided the access solution for the vertical walls in the central cylindrical structure that will house the vacuum vessel of the plasma container . 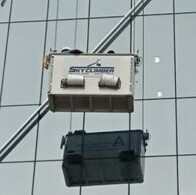 Sky Climber replaced the original window cleaning system from 1988 with a replacement BMU system that complied with current European Norms. 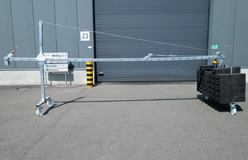 Sky Climber designed a specific BMU with a double jib and a compact body. Several combinations of Sky Climber Light Weight Stage platforms have been used. Sky Climber BMU and PI Division designed a new fully-counterweighted machine running on the new track line. The track line is fitted with a motorised turning table to allow the BMU to go into a parking track siding. 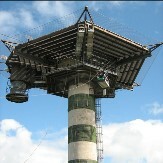 Sky Climber Light Weight Stage (LWS) platforms were used during the refurbishment works. Adelaide Oval Stadium, Australia : Sky Stage Ultra with Low Profile Walk-Through Stirrups. Sky Climber platforms were used during the renovation works and for the replacement of the floodlights in all the grandstands from Adelaide Oval Stadium in Australia. Different platforms and rotatable davit arms for Marina Platforms in Egypt. 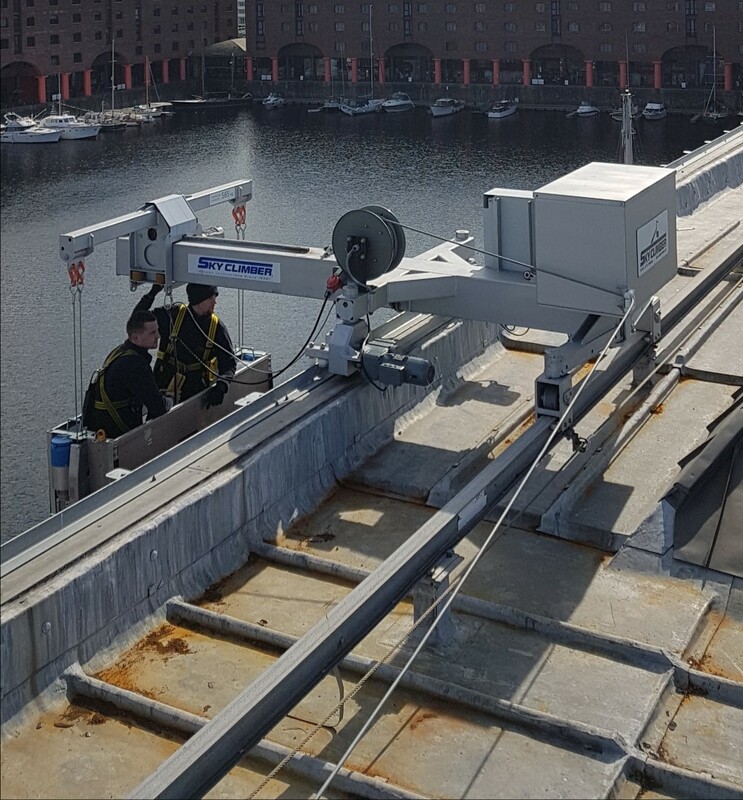 Sky Climber delivered different platforms and suspension solutions for permanent and temporary installations to Marina Platforms in Egypt. Electrical C-Trolley for the SC-134 monorail. Launch of the Electrical C-Trolley for the SC-134 monorail profile. Sky Climber produced a complete new electric monorail C-trolley that is designed to fit our SC-134 monorail profile in combination with side mounting brackets. 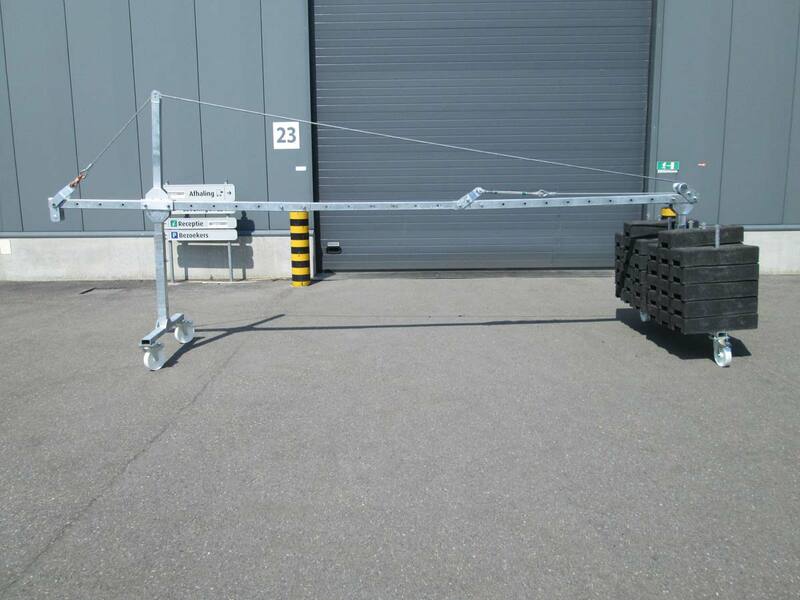 a flexible solution for monorail installations. Sky Climber developed a manual monorail turntable. This turntable allows to switch the monorail trolley to different monorail tracks and has the possibility to change the angle every 15 degrees (from 30° to 150°). It will provide you a flexible solution for monorail installations on complex buildings were a combination of monorail tracks is used. CE- Approval of the electronic overload device (Sky OL). CE- Approval of the electronic overload device (Sky OL). 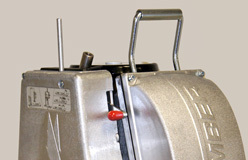 This safety device is mounted inside the hoist (for temporary installations) and inside the CCB ( for permanent installations) and will stop the functioning of the hoists when overload is detected. The Sky OL follows the standard EN ISO 13849-1 and Machinery directive 2006/42/CE. 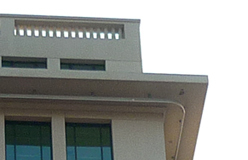 monorail tracks for the Central Bank of Vietnam. 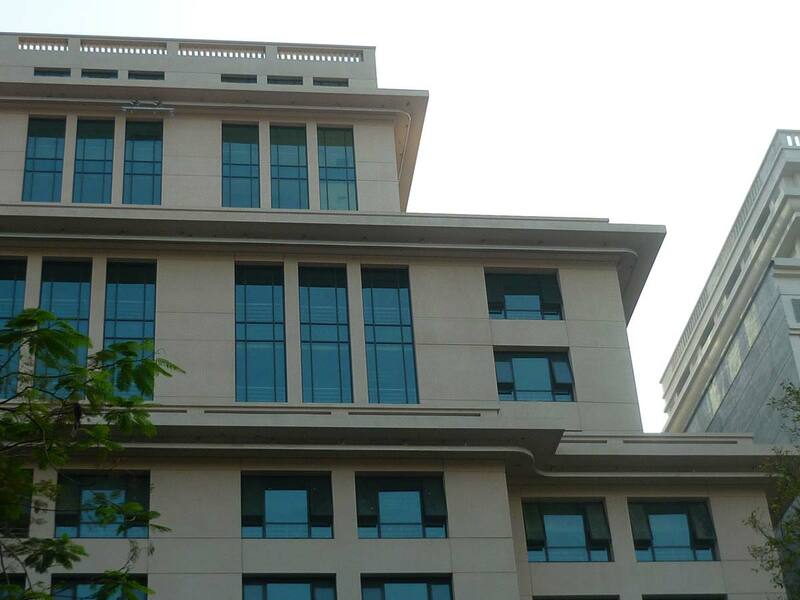 Installation of 380 meter of SC-160 monorail tracks on the Headquarters of the Central Bank of Vietnam in Hanoi. the new LNX Hoist goes in production. Production of the first 50 pieces of the new LNX Hoist. This fully integrated electric hoist is available with a lifting capacity 300kg, 500kg and 650kg and is CE approved. Pneumatic Rescue System for G4S in Stabroek (Belgium). 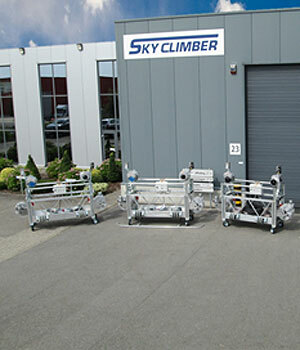 Sky Climber delivered a Pneumatic Rescue System to G4S in Stabroek (Belgium). This system combines a modular suspension structure, adjustable in height and length, with a pneumatic hoist. 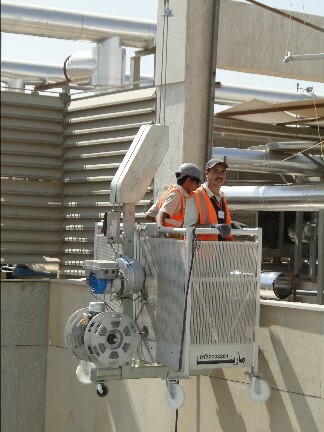 Special features of this system: Hoisting speed is adjustable between a high and low speed, pneumatic wire winder and a remote control box for the operation of the pneumatic hoist.